Growing up, my siblings and I were surrounded by art. In our house, jazz and opera were always playing, literature lined the shelves, and the work of local artists hung on the walls. My father taught theater history at California State University, Stanislaus, in Turlock, directed plays, and even acted now and then. My mother, an accomplished musician, played piano, organ, and guitar. Both made sure my siblings and I were exposed to museums, live theater, and music. We saw just about every play my father directed at Stan State. My parents rarely took the two-hour drive into San Francisco without at least some of my five siblings tagging along. The theaters at the American Conservatory Theater, the Legion of Honor, the de Young museum, and the San Francisco Museum of Modern Art were all familiar to me by the time I was 15. I left the Central Valley to pursue higher education in the Bay Area and then Boston. My goal was to work in a museum as an educator; I wanted to see that spark of joy on the faces of children learning about beautiful works of art. That was an experience that had mattered to me as a child, and I knew it could, and should, matter to lots of kids. But I thought then, as many of us do, that performing arts venues and museums were mostly located in big cities. I moved back to Turlock for the position as the city’s arts facilitator managing the Carnegie Arts Center, after more than 15 years of experience in some of those “big city” museums, to prove that’s not true. The greatest motivator for my decision was the potential for real impact. I craved direct involvement in the planning and implementation of programs for a community that I could connect with. Here in Turlock, I wanted to bring the arts alive through direct contact with patrons and neighbors. In 2001, the year I returned to Turlock, there were relatively few resources for anyone with an interest in the arts. The university had a small art gallery and a theater for student and faculty shows. Most of those who attended exhibits and performances were already connected to the university. Town residents often expressed discomfort about attending university functions. In town, one framing shop showed the works of local artists, two music stores offered lessons, and two dance studios taught ballet and tap. In 1999, the old high school auditorium had been re-opened as a performing arts venue and attendance was building, but slowly. Many kids in my hometown were already at an “arts disadvantage.” Their parents are less likely to be college-educated (only 16.4 percent of Stanislaus County residents over 25 have a bachelor’s degree, compared to a statewide rate of over 30 percent), and several studies have shown that education levels are one of the key factors in arts exposure. Exposure is more likely to lead to participation and enjoyment. Adults who didn’t have the good fortune to visit museums or see live theater in their youth may not pursue arts opportunities for their children. A two-hour drive to attend a museum, play, or concert in the city might not seem worth it. 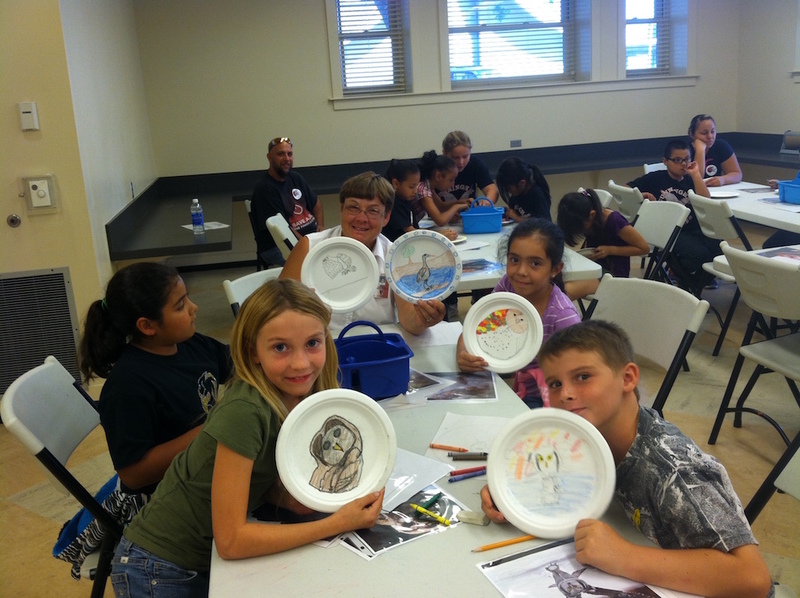 So how could young people in Turlock, a town of 70,000 in a rural county, get exposure to the arts? How could we prevent them from feeling that the arts are just for rich or privileged people who live near museums and concert halls? These questions grabbed my attention. My ambitions were initially small. Our art gallery was located in a 90-year-old former public library building, with no air conditioning or ADA-accessible facilities. Our staff was me, a part-time clerical assistant, and a handful of dedicated volunteers. Our funding from the city covered just salaries; donations paid for exhibitions of local artists and a sporadic program of poetry and theater. At first, we had a hard time broadening our reach and making contact with new, young families. Everything I read said that a positive first experience was the most proven way of encouraging later attendance at arts events. So I initiated school field trips and expanded after-school and summer classes for kids. We raised funds for an accessible classroom, gallery, and restrooms. Those efforts literally went up in smoke when fire ravaged the historic structure in 2005. However, with community support and a forward-thinking city council, we rebuilt—and created something the community is incredibly proud of. The Carnegie Arts Center in Turlock, California. Constructed with funding from the city and now operated independently by the non-profit Carnegie Arts Center Foundation, the new facility includes two well-equipped art studios, a multi-purpose room that can serve as a rehearsal space for dance or theater, a black box theater, and a concert, film, and lecture venue. 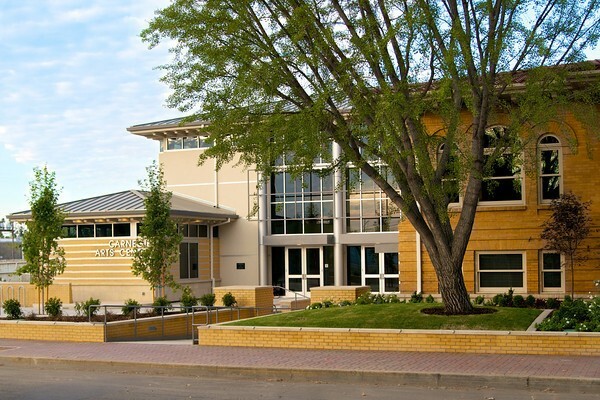 The Carnegie schedules educational and entertaining programs all year long while also partnering with other community organizations to present their events. Our museum-quality exhibition space draws “big city” shows: In 2011, we featured Ansel Adams; in 2012, Edgar Degas; and in 2013, Pablo Picasso. Most important, the new gallery brings quality art experiences into the lives of students. More than 30 years after the passage of Proposition 13, which cut local tax revenues for California public schools and virtually eliminated arts programs, schools still struggle to find a budget for the arts. Studies in Santa Clara County and Los Angeles County within the past 10 years found that most local school districts allocated less than 2 percent of their annual spending to arts education. From 2004 to 2006, California had no dedicated source of state funding for arts education. Even with the adoption in 2001 of specific content standards in visual and performing arts, many schools struggle to provide arts programs or professional development. Many elementary school teachers have told me they feel unprepared in visual arts instruction. At the Carnegie, we have spent four years building a program with schools in our city and within a 40-mile radius. Field trips are based not only on seeing the work of famous artists, but also on a hands-on studio component. Lessons of the gallery come to life as each child creates something of his or her own to take home. Our current exhibition features work of the Art Nouveau-era graphic artist Alphonse Mucha. In the gallery, students learn about how he created compositions advertising a variety of products. In the studio, docents talk about framing, symmetry, and use of text to promote and sell. The students then create their own advertising poster. 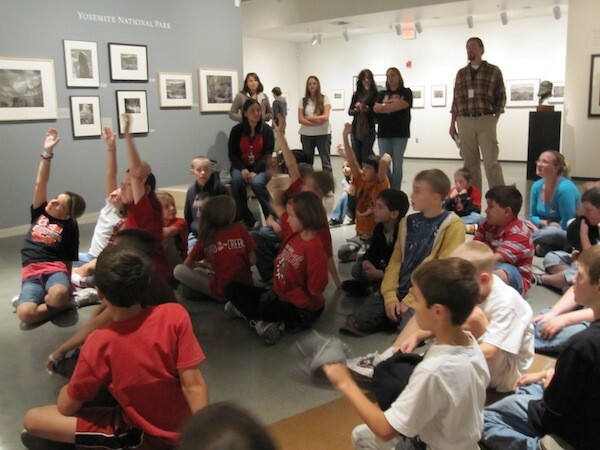 Fourth graders from Curtis Creek Elementary School in Sonora visited the “Ansel Adams: California” exhibition in 2011. After just the first year of this new program, more schools requested opportunities to engage—and not just with exhibits of world-famous artists. In 2011, we began a partnership with the Ceres Unified School District. Each spring now, every Ceres fifth grader visits the Carnegie Arts Center to see the works of local and regional artists. We develop lessons around basic elements of art that teachers can build on after the visit. Since 2011, more than 10,000 students have come through our doors. And participation should only increase. With the support of local businesses and individuals, we are able to pay most, if not all, costs to allow schools to bring classes to our gallery. Teachers tell us again and again that they would not be able to teach their students about the arts without the resources we provide. Other organizations in the region are also committed to exposing young people to the arts. The Gallo Center for the Arts, which opened in nearby Modesto in 2007, has built a similar education program for theater performance, and their funders support tickets and transportation for thousands of school children each year. The Central California Art Association recently began a program called CLASS—Community Liaison for Art in Stanislaus Schools—that puts experienced artists into elementary school classrooms. Arts access for children in the region is growing. My goal is to make sure that the fourth and fifth graders visiting the Carnegie now feel like they are entitled to the arts. If they understand how the arts can enrich their lives, they will ensure that their children have that same advantage. As we continue to expand and develop arts in our region, there should come a time when no child in my community feels that the arts are out of reach. Lisa McDermott is the director of the Carnegie Arts Center in Turlock, California. She previously worked at museums including the Rose Art Museum at Brandeis University and has taught museum studies and art appreciation at universities including Boston University. “Living the Arts” is an arts engagement project of Zócalo Public Square and The James Irvine Foundation. Primary editor: Becca MacLaren. Secondary editor: Siobhan Phillips. *Photos courtesy of Lisa McDermott.